Ever wondered what happened to Aladdin’s Cave? Well, it’s time to put your explorer hat on and find out! Indeed, thanks to NYX and Scientific Games you can hop on the magic carpet and explore the mythical world and legends that surround Aladdin. Indeed, Aladdin’s Legacy video slot is not only a game that will transport you in a cave filled with precious gemstones. But it’s also an adventure game where you’ll need to solve puzzle via a Pick n’ Click Bonus game to find your way out of the cave before it collapses. In fact, Aladdin’s Legacy pretty much re-defines the player’s experience! We think it delivers a quest like no other slots we’ve seen before. Head out for an epic adventure at any online casinos listed on this page. Alternatively, continue reading this page to get additional information that may put you on a winning path! How to trigger the bonus features of Aladdin’s Legacy video slot? To sum up! 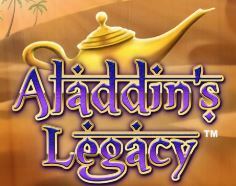 Aladdin’s Legacy has 2 main bonus features a Free Spins game and one of the best Pick n’ Click game we’ve seen in video slot in a very long time. First, it’s important to point out that you’ll trigger the Free rounds with the help of 3 or more Aladdin’s lamp symbol. Moreover, the numbers of free rounds you’ll win is progressive and according to the numbers of Scatters that have landed on reel 1 to 5. But, know that the maximum amount of Free Spins you’ll play is 20. Loot the cave and escape on time! Generally speaking, Pick n’ Click games are not that exciting. But this one is quite different since it has 5 different levels that you’ll need to progress through to win the max win of this slot. In short, you can only activate the Pick n’ click game via the Free Spins. And you’ll need to get a Cave symbol on reel 5 to start the bonus feature. This will take you to the door of the cave where you’ll need to solve your first puzzle by picking 3 gemstones correctly. Once you’re in, you’re free to loot the cave! But, you’ll also need to find your escape path before the cave collapse. Look at the map you’ll see on the next screen carefully and find your way out through the 4 different levels to escape with the treasure. Why should you play Aladdin’s Legacy video slot? On the whole, you can tell NextGen put a lot of efforts in this game. In fact, not only are the graphics impressive but the soundtrack too. Indeed, know that this game as four different soundtracks that accompany the action and they help deliver a real adventure. And the game intro sets the tone well for an excellent adventure. By and large, Aladdin’s Legacy is perhaps one of the best game ever produced by NextGen in our opinion. Plus, it’s one of those games that players don’t know super well and would be wise to try since the paytable is very high and the game has a low volatility index. Start your quest with a casino bonus and have fun!